The Indian government also took several measures to ease liquidity and call rates fell to around 6-6.25% on Friday from 15.50-16.50% touched on 10 October. This week global money markets will be watched closely for cues on the credit crisis. If overnight borrowing costs ease further, it would be the first sign of a bottoming out in equity markets. The unlocking of credit markets would mean fresh flows of money into equities. Indian markets fell last week despite a recovery on US bourses, which spearheaded the global meltdown. The principal cause of the decline on Indian bourses was a lack of liquidity and persistent selling by foreign funds that have dumped stocks worth Rs9,869.4 crore so far in October alone. Steps taken by the Reserve Bank of India (RBI) to attract dollar flows will succeed in coming weeks in case the credit situation eases further. And that might herald a new beginning for Indian stock markets. This week, investors would be riveted to RBI’s mid-term monetary policy review on 24 October to see what the central bank does, especially against the backdrop of an industrial slowdown and tremors in the services sector. A cut in interest rates by 50 basis points (one basis point is one-hundredth of a percentage point) is most likely and already factored in by the street. Any additional aggressive measures by the bank would boost sentiment and may trigger bargain buying. Technically, the markets are still in bear grip. A close below 10,000 points for the Bombay Stock Exchange’s benchmark index, the Sensex, on Friday was bad for sentiment, but a technical analysis shows it was a function of momentum. On its way down, the Sensex would test its first support level at 9,818 points. However, this may offer only limited support to a falling Sensex. If the Sensex dips below this level, then the next support will come at 9,357 points. This level is likely to offer good support to a falling Sensex and the chances are bright that the index might consolidate around this. If this level holds, there would be a bounceback, which would have the potential to place the Sensex back above 10,000 points. However, if this level also goes with higher falling volumes, then there would be a knee-jerk reaction that might pull down the Sensex to 8,928 with selling pressure still present in the market. 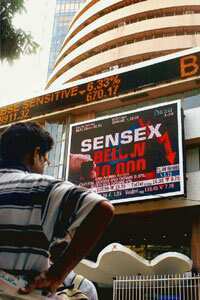 The short-term bottom for the Sensex would be between 8,464 and 8,800 points, with 8,464 offering rock-solid support. On its way up, the Sensex would test its first resistance at 10,253 points; though a moderate resistance level, this may signal gains if it is breached with higher rising volumes, with the next important resistance coming at 10,789 points. This would be a critical resistance level as it may have a major bearing on short-term sentiment. If the Sensex breaches this level (probability 85%) then the rally would extend further, which might take the Sensex to 11,204 points, followed by immediate resistance at 11,336. This would be another critical band for a rising Sensex, which if broken would be a bullish signal as the next meaningful resistance would then be coming at 11,873 points. It is rather ironic that there are some very good bullish technical formations in the making but the momentum at this point of time remains weak. However, joining all the threads together, it appears that the markets are in the last leg of the decline and a turnaround is just around the corner. In terms of the S&P CNX Nifty, there is immediate support for a falling Nifty at 3,037 points, which is a moderate level. If this level is breached, then the next support level would come at 2,932 points. This level is likely to offer good support to a falling Nifty, which may consolidate around this level. A downward break would be bearish with the next support coming at 2,774 points and rock-solid support at 2,595 points. On its way up, the Nifty might find its first resistance at 3,108 points, a moderate level that would signal gains with the next resistance at 3,234 points. This will be an important resistance as a close above this level would be a bullish signal and would extend gains to the next and most important resistance level at 3,328 points. A comfortable break above this resistance or a close above it would mean the end of negative sentiment and the bear run in the short term, with more gains likely. Among individual stocks, Bombay Rayon Fashions Ltd (BRFL), Larsen and Toubro Ltd (L&T) and Yes Bank Ltd look good on the charts. BRFL at its last close of Rs183.55 has a target of Rs197 and a stop-loss of Rs167. L&T at its last close of Rs799.40 has a target of Rs828 and a stop-loss of Rs768. Yes Bank at its last close of Rs76.80 has a target of Rs87 and a stop-loss of Rs62. From the previous weeks’ recommendations, State Bank of India touched a high of Rs1,589.80, which was well above its target of Rs1,392, showing a gain of over 17.5% during the week. HDFC Bank Ltd touched a high of Rs1,248, which was sharply above its target of Rs1,084 and a gain of around 19% during the week. Steel Authority of India Ltd touched a high of Rs120 and met its target of Rs116 very comfortably.